Pininfarina and Bollore planned to invest 150 million euros to build the four-seat Bluecar EV designed by Pininfarina. TURIN -- Even as it was phasing out its other vehicle assembly operations, Pininfarina had hoped to specialize as a producer of electric cars. In 2007, the Italian company signed a 50:50 joint venture with French industrial group Bollore to build 15,000 EVs a year. The partners planned to invest 150 million euros (about $202 million) to build a four-seat model designed by Pininfarina. Powered by Bollore's lithium metal polymer battery, the car was said to have a daily range of 250 kilometers (about 155 miles). Initial plans called for the electric car to be sold as a Pininfarina model in Europe, the United States and Japan starting in 2010. The partners had hoped to deliver 2,000 electric cars this autumn and to sell 15,000 units annually by 2012. But Pininfarina and Bollore clashed over strategy – a fight triggered by diverging EV subsidies in France and Italy. On Nov. 12, Pininfarina announced that it had negotiated a deal to sell its 50 percent stake in the venture. Pininfarina has the option to sell its stake for 10 million euros – equal to the venture's book value – between March 1, 2011 and March 15, 2013. 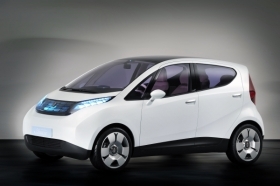 But if Pininfarina is sold, it has the right to unload its share of the EV venture as early as Dec. 31, 2010. This clause has fueled speculation that Milan-based merchant bank Banca Leonardo's 15-month quest to sell Pininfarina soon may be fulfilled. Another hint of a looming sale of Pininfarina came from the financial markets. The company's shares now trade at about 3.00 euros following a high of 3.89 euros on October 12. The increase was fueled by rumors of an imminent ownership change. Pininfarina shares sunk to 1.60 euros on August 2 ahead of the release of disappointing first-half results.